Southland is New Zealand's southernmost region with one city, Invercargill and main townships of Gore, Winton and Lumsden. The region is home to Fiordland National Park and includes Stewart Island, much of which is set aside as Rakiura National Park. Bluff is a town and seaport located in the Southland region on the southern coast of the South Island of New Zealand. The town is at the end of a peninsula which forms the western side of Bluff Harbour and Awarua Bay, with the port located in the relatively narrow entrance channel. Bluff is on State Highway One, which terminates one kilometre to the south of the town at Stirling Point. Bluff is 30 km by road from Invercargill. Bluff is also the southern terminus of the South Island Main Trunk Railway. Contrary to a popular misconception, Bluff is not the southernmost point on the New Zealand mainland. That honour goes to Slope Point, some 50 km east of Bluff. It is, however, the southernmost town in the South Island. Bluff is dominated by Bluff Hill, an extinct volcanic cone which provides some shelter from the prevailing westerly winds. Across the channel from Bluff is Tiwai Point, home to New Zealand's only aluminium smelter and its wharf. Bluff Harbour is the terminus for the twice daily catamaran ferry to Stewart Island located 60 km south across Foveaux Strait. The harbour is also home to the Foveaux Strait oyster fleet. Bluff oysters are renowned for their succulence and flavour, and are considered a delicacy nationwide. Gore is a town and surrounding borough in the South Island of New Zealand. It is also the name of a district in the Southland region. the town of Gore is situated 64km northeast of Invercargill and 70km northwest of Balclutha. Originally known as Longford, Gore was renamed after Sir Thomas Gore Browne an early Governor of New Zealand. The second largest centre of population in Southland, it is a manufacturing centre and service town for the surrounding farm communities. It is divided by the Mataura River into Gore and East Gore, the majority of the town being situated on the western banks of the river. Gore is known in New Zealand folklore as the home of Hokonui moonshine. During the days of prohibition, the Hokonui Hills to the west of the town gained a reputation for the production of illicit alcohol. Gore is also well known for its connection with Country and Western music, with the annual New Zealand country music awards being held in the town. Invercargill is the southernmost city in New Zealand, and one of the most southern settlements in the world. It is the commercial centre of the Southland region. It lies in the heart of the wide expanse of the Southland Plains on the Oreti or New River some 18 kilometres north of Bluff, which is the southernmost town in the South Island. In 1856 a petition was put forward to Thomas Gore Browne, the Governor of New Zealand, for a port at Bluff. Browne agreed to the petition and gave the name Invercargill to the settlement near the port. Inver comes from Scots Gaelic meaning at the mouth of river and Cargill is in honour of Captain William Cargill, who was at the time the Superintendent of Otago, of which Southland was then a part. There is a large park, Queens Park, just north of the main city centre. This park has botanical gardens, an aviary, sports grounds, and is also home to the Southland Museum and Art Gallery. Riverton is a small town at the bottom of the South Island of New Zealand. It is in the province of Southland and lies at the western end of Oreti Beach, 30 kilometres west of Invercargill. Riverton was the first recorded settlement in New Zealand. The Pourakino and Aparima Rivers empty into Foveaux Strait at Riverton. Stewart Island is the southern most island of New Zealand. The Island is large, 64 km long, and 40 km across (at its widest point). It has a 700 km coastline, but there are only 20 km of roads! You won't walk round the Island in a day. Even ten days tramping only skirts the northern third. Few people can claim to have seen anywhere near the whole of Stewart Island. However, there is much to see, even close to the only settlement of Oban. For a day-trip or stay longer, as there is a good range of accommodation. Some visitors from twenty years ago are still living here. Terrain is rugged. The Island is made of granite, some of the oldest rock in New Zealand. A wide range of minerals are present, though not in commercial quantities. Tin was mined at Port Pegasus for a few years in the 1890's. There's black iron sand on some beaches, others are white with quartz or red with garnet. Most beaches are gold, sparkling in the sun. Don't bother bringing a gold-pan though - it's mainly "fool's gold"! Paterson Inlet almost cuts the Island in half. This large expanse of water is popular for boat-trips and recreational fishing and diving. Climate is mild, and a trifle damp. No worry, without rain, there wouldn't be rain-forest. The eastern lowlands are forest, right to the water's edge. A canopy of kamahi is pierced by majestic rimu and miro. Lianes and lush fern growth adorn the bush interior. The forest is a haven for bird-life, as there are fewer predators than on the mainland. Kaka, parakeets, tui, and bellbird give a wonderful dawn chorus in spring. New Zealand's national bird, the kiwi is found all round the Island. Seabirds abound off-shore. Albatross, petrels, cormorants, gulls and blue penguins are common. Rarer species like yellow-eye penguins are also seen often. Mason Bay, on the Island's West Coast is much different. It's a 12 mile crescent of sandy beach, with huge sand-hills and tussock and scrub in place of forest. This is the place to watch the white horses charge ashore in a screaming westerly gale. 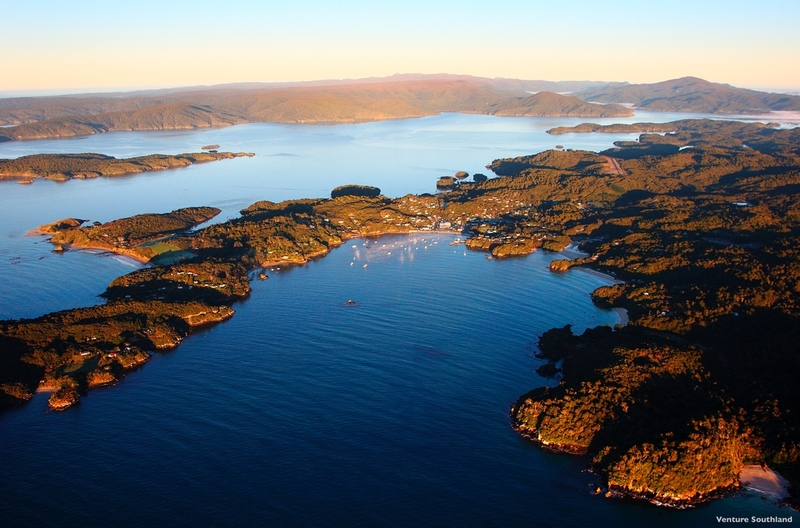 The original Maori name, Te Punga o Te Waka a Maui positions Stewart Island firmly at the heart of Maori mythology. Translated as “The Anchor Stone of Maui’s Canoe”, it refers to the part played by this Island in the legend of Maui and his crew, who from their canoe, the South Island, caught and raised the great fish, the North Island. Rakiura is, however, the more commonly known and used Maori name. It is usually translated as "Glowing Skies", possibly a reference to the sunsets for which Stewart island is famous or for the aurora australis the Southern lights that are a phenomenon of our Southern latitudes. For some, Rakiura is the abbreviated version of Te Rakiura a Te Rakitamau, translated as "great blush of Rakitamau", in reference to the latter's embarrassment when refused the hand in marriage of not one, but two daughters of an Island chief. In 1809 the Pegasus, sailing from Port Jackson, Australia, on a sealing expedition, had aboard as first officer William Stewart. Whilst the boat was in the large south eastern harbour which now bears its name, Stewart began charting the southern coasts and his work is acknowledged to this day in the Island’s present name.